Little Giant 566226 Submersible LED Light and Low Voltage Transformer | Fountain City Art Ctr. 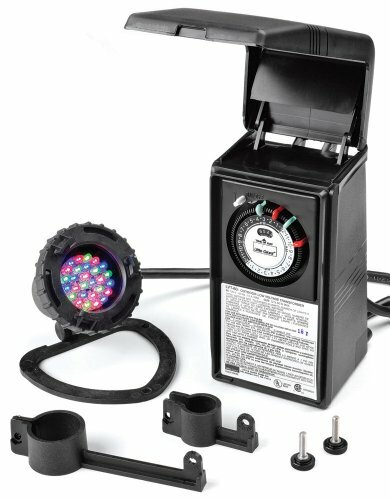 Submersible LED light and transformer kit includes one LED light with free standing support, fountain nozzle attachments in two different lengths and transformer. Weatherproof, 120-volt/60 watt transformer with built-in, variable, on/off timer. Powers up to 15 3 watt lights. Fully submersible light with 3 watt LED bulb. Light attaches to all little giant fountain nozzle stems or stands alone. May be used out of water for accents. Transformer has a 2-feet cord length and the light has a 20-feet cord length.